Crestliner of Otsego, Minnesota, a Brunswick Boat company, has been a well known, respected, and prominent boat brand for nearly seventy years. 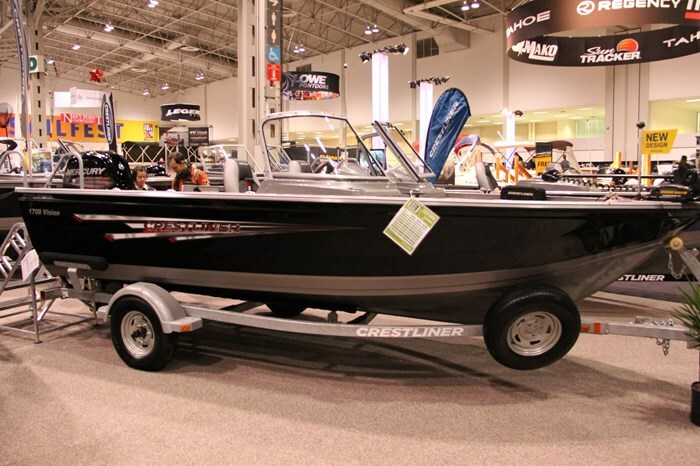 Building only all-welded aluminum boats dedicated to the fishing and outdoors enthusiasts market, for 2015 offers a comprehensive lineup of five major categories of boats comprising twenty-two series and resulting in over sixty models of boats ranging from ten to twenty-two feet. The 1700 Vision, subject of this review, is a brand new model for 2015 and indeed it is so new that it didn’t even appear in Crestliner’s initial 2015 printed catalog. The two Vision models, 1600 and 1700, are two of twenty-three models from twelve to twenty-two feet in eight series comprising Crestliner’s Multispecies category. The all-new 1700 Vision continues the theme of versatility introduced on the 1600 Vision last year. One of the big changes in the 1700 Vision over the 1600 Vision lies in the specifications. The 1700 Vision is only slightly longer than its smaller sibling at seventeen feet, six inches or just over one foot longer but it is a considerable seven inches wider, with six inches greater chine width, and the boat itself without motor, at 1,190 pounds, weighs two hundred and fifty-five pounds more. As a result, it is rated for a maximum 115 horsepower and six person capacity versus only 60 horsepower and five persons in the 1600. 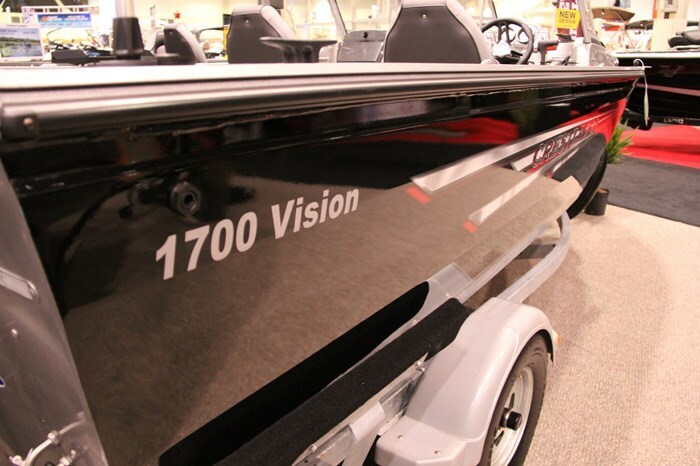 Whereas the 1600 Vision feeds off a 12-gallon portable gas tank, the 1700 Vision has a built-in 20-gallon fuel tank. The all-welded hull of the 1600 Vision continues in this 1700 Vision utilizing Crestliner’s standard 4x hull construction which is 4-piece all-aluminum with tongue and groove channel construction welded on both the interior and exterior and with a welded full-length extruded centre keel. The transom deadrise on the 1700 Vision has been increased from 10-degrees on the 1600 to 12-degrees on this new model to provide greater wave cutting ability and a smoother ride in rough water. Again, versatility of the interior layout has been maintained in this new model. 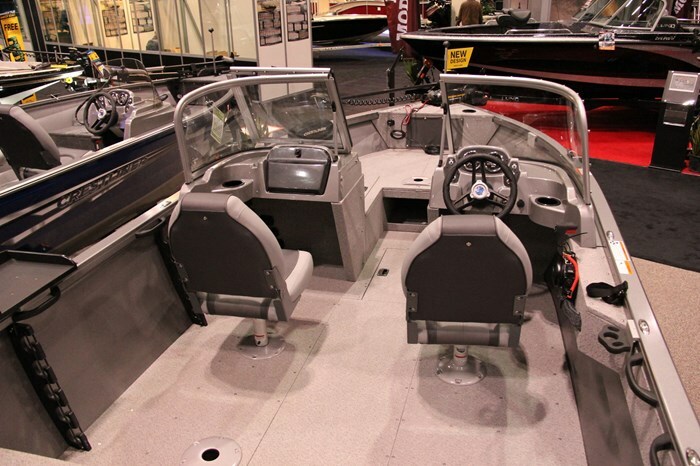 The standard layout is a Side Console (SC) configuration but this may be optionally upgraded to a Dual Console (DC) or a Walkthrough (WT) full windshield configuration – and here’s the versatility factor – this may be decided when first ordering the boat or accomplished later on as a dealer-installed add-on. This new 1700 Vision adds the potential versatility of optional port and starboard fold-down jump seats within the stern casting deck for additional passenger seating while maintaining the standard storage found beneath these seats. Also, on the inside of the cockpit portside gunnels are rod holders capable of storing a total of five rods; three up to 9’6” and two up to 8’ long. 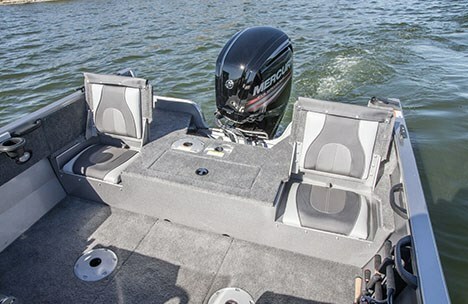 In addition, an in-floor dedicated trolling motor battery compartment with 24-volt system compatibility is located beside the driver’s helm. Also standard on this new model is Crestliner’s removable SureMount aluminum accessory brackets which let you slide your favorite accessories along the gunnel for perfect placement without drilling. Within the bow casting deck are large port and starboard storage compartments and a smaller compartment with a vinyl curtained front is located within the forward trolling motor mounting deck which is pre-wired. Six floor bases are provided for the two standard movable Deluxe folding fishing seats. Standard flooring material throughout is 16-ounce marine grade carpet. Centred within the stern casting deck is a 13-gallon aerated livewell. A completely new fibreglass molded driver’s console with windscreen (in the case of side or dual console, or a high three-piece safety glass windshield with rounded corners in the case of the walk-thru windshield configuration) comes complete with standard speedometer, tachometer, fuel gauge, and 12-volt outlet with a black sport steering wheel and molded in drinkholder. Four Mercury EFI FourStroke outboard motors are available in 60, 75, 90, and 115 horsepower. The 90 and 115 motors will require the 25” transom option. A black bunk Shoreland’r trailer comes with the 1700 Vision. 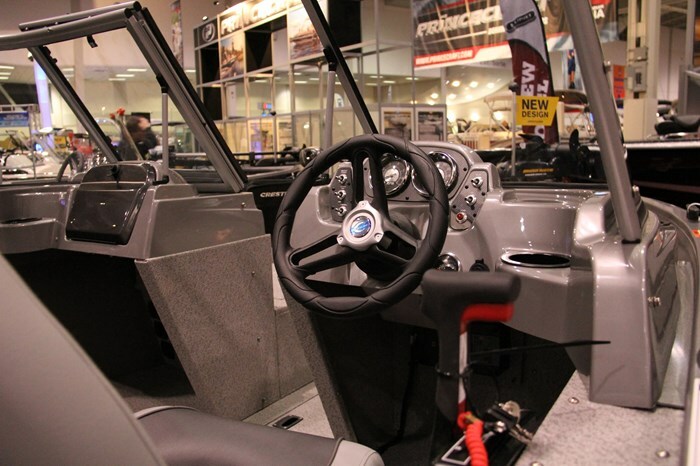 Notable optional features include four available packages: a MotorGuide or MinnKota Fish Package includes additional SureMount accessory mounting brackets plus a 2-bank battery charger plus the appropriate trolling motor brand; a Sport Package includes a Jensen MS30 stereo with two speakers, stern jump seat, swim platform with ladder, and a removable waterski pylon; and a Full Enclosure Package is available if you have chosen the Walkthrough full windshield configuration. Available individual options include the portside console with locking glove box, drinkholder, and throw tray to create the DC or WT configurations, vinyl flooring, additional seating, battery chargers, a large in-floor lockable rod storage compartment for ten rods with tubes within the bow deck, plus choices of Lowrance depth/fishfinders.